The brioche looks wonderful, Betty and I'm sure you'll find plenty to choose from in Paris during your trip. The Barefoot Contessa is one of my favourite TV programmes and I think I have almost all of her books. Haven't tried the brioche yet though. Have a wonderful time and Happy Birthday in advance from me! Oh my, but the brioche look tasty! Wishing you a wonderful trip and look forward to hear about your adventure! One last try on a comment. My first two vanished....love brioche and will give this a try. I like to use brioche for French toast. The brioche looks delicious. I'm lucky -- there is a French bistro right across the street from me -- way too convenient. Enjoy your trip. It will be loads of fun with your grand-d's and daughter. Sweet memories in the making. Happy Monday! Looks delicious. There is a bakery near where i live. And they have recently started selling brioche. Yes it does have a nice glossy finish. I am not a good bread maker so i dont try any more. The brioche looks delicious! What a marvelous time you'll have in France with your daughters and granddaughters. I love making bread, but haven't made brioche for years. This is tempting me. Oh, the loaves look scrumptious! I'm going to try brioche. Have a wonderful time in Paris!!!! I know that you'll have a marvelous time in Paris...vraiment merveilleuse!! I haven't ever made brioche, but I love it. Several bakeries here in town make it, so I am able to just pick it up when I feel the need for strong coffee and brioche, butter and jam. Mmmmm. It looks absolutely delicious! The egg wash on top sure adds the perfect Parisian touch. You'll have a great time on your visit. This is on my learn how to make list before the year is out. I love the glistening top and have fun with your girls. Safe travels!! Wow what a good looking loaves, I think they are more enjoyable to eat. I can't wait to make it by my own. Thanks for sharing such a nice thing. Betty I love brioche and have the same cookbook. You have inspired me to bake this weekend. Oh dear Betty I have a good recipe for Brioche too. I make the one with the little ball on top, lol.. Anyway, it's a great bread recipe. Thank you for sharing. How exciting you are going to Paris with your daughter and grand for your birthday. Have a great trip, I know you will. Betty, your brioche loaves are gorgeous. 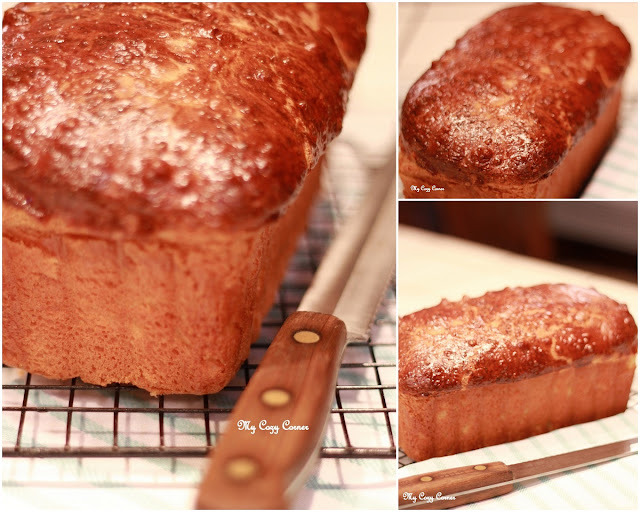 I just today posted a traditional Norman brioche loaf called Fallue. I'm sure you'd like it. Have a wonderful trip!